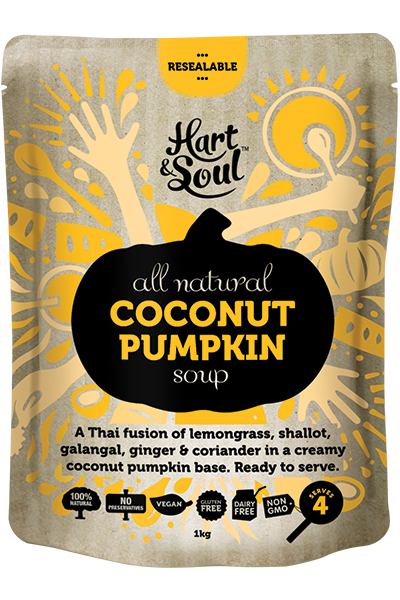 A Thai fusion of lemongrass, shallot, galangal, ginger & coriander in a creamy coconut pumpkin base. Serve garnished with a spring of Thai Basil. Water, Pumpkin (34%), Coconut Milk (19%), Shallot, Lemongrass, Garlic, Rice Bran Oil, Ginger, Galangal, Salt, Chili, Coriander. Made in a facility that processes Crustaceans, Egg, Fish, Peanut, Sesame, Soy & Tree Nuts.